Since at first it was difficult to discern which one was in fact the DVD as it was inconspicuously included in the set of 3-discs that all resembled baseballs signed by Paul McCartney, I wasn't expecting all that much from the CD's concert disc. This being said, of course McCartney's name promises quality, innovation and showmanship, considering the length and evolution of his career with The Beatles, Wings, or alone. Still overall I feared it would most likely be a nice but brief selection of clips and performances similar to the ones contained in Andrea Bocelli's breathtaking album but breathlessly short DVD last year. However, this epic November 17 release, which was also issued on vinyl and part of a 4-disc collection that boasts an extra DVD for McCartney's most ardent admirers, treats us to a full out, state-of-the-art concert with dozens of songs and hours of incredible footage. 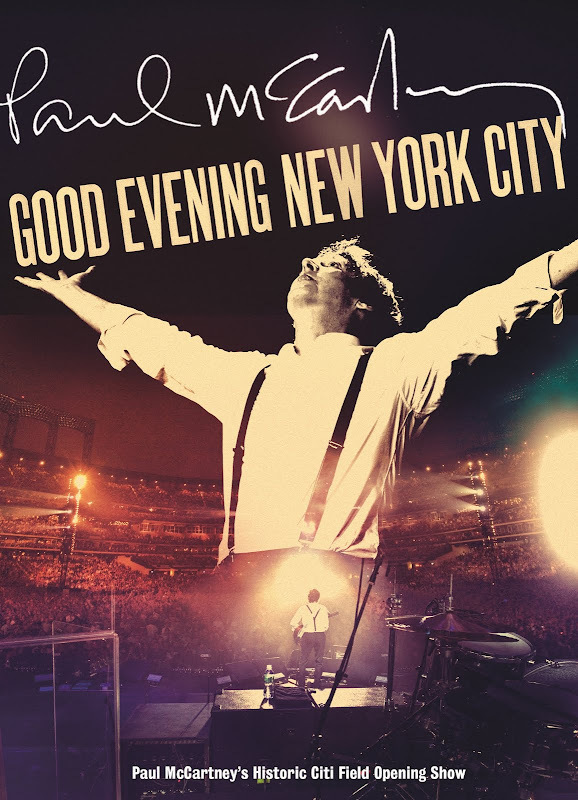 Surpassing some of the individually sold live concerts that have premiered on DVD and Blu-ray this year, Concord Music, Paul McCartney and Hear Music's Good Evening New York City is the closest thing to experiencing the genuine feel of a concert in your own home due to its phenomenal technical specifications. And since the main focus is on the music, instantly the sound mixes are what grabs you both in the 5.1 and stereo track. Yet once you become acclimated to McCartney's continually playful and infectious delivery of songs he's performed thousands of times before, you're soon overwhelmed by the mixture of musical adrenaline and sheer joy apparent in the guitar pic precise visual presentation. Even before I read that fans in the crowd were given 75 Flipcams to achieve an unparalleled sense of “you are here” digital authenticity in tandem with the fifteen professionally manned high definition cameras during the trio of New York Evenings in July from which the footage was pulled, I could sense that groundbreaking techniques were at work. And the mesmerizing experience is well worth it as the concert DVD contained in this set preserves the historic three-night event of McCartney's return to musically christen the new site of the landmark Shea Stadium, which was torn down, rebuilt “a few hundred yards away” and renamed Citi Field. The engagement from July 17-21 critically dubbed “the experience of a lifetime” is especially significant considering McCartney's Good Evening was staged both one year after joining Billy Joel's farewell to Shea Stadium in the last concert before its demolition and forty-four years after The Beatles played the venue and gave birth to stadium rock in 1965. On August 15, 1965, The Beatles played a twelve song set filling out just thirty-four minutes for 55,600 screaming fans (that also included McCartney's future wife, Linda Eastman) who drowned out the sound of the band during their sold-out performance. And in the three Good Evenings in 2009, 109,397 people gathered in Citi Field to celebrate the lineup captured in this two hour and forty minute concert which consisted of thirty-three songs. From beloved hits that span the course of his impressive career including rousing renditions of “Drive My Car,” “Band on the Run,” and “Live and Let Die,” and many others, McCartney switches instruments several times throughout. Effortlessly he moves from a ukulele that was given to him by George Harrison to the piano and several guitars including one enviable brightly colored electric model on which he wails Hendrix's “Foxy Lady." And at the same time, Paul McCartney proves that his vocal and instrumental musicality is still top-notch even after all these years. With footage from longtime collaborator Paul Becher, McCartney thrills us as light beams out onto the audience like snow and video installations change from incredibly well-designed visuals to enhance the meaning of the music with a multimedia approach that mixes nicely with enhanced live closeups of the band at play. Therefore, McCartney's dazzling Evening concert DVD manages to engage us even more than the 2-CD set of the exact same performance since the event transcends just the audio and becomes a full-blown concert right in your living room via the third inconspicuous baseball DVD.